If you reading this article, chances are you’re looking to speed up your process of academic research. Whether you’re a beginner in academic research or an experienced writer with published works, the process can be quite challenging. So we recommend treating each research project accordingly to avoid being stuck researching your paper for hours. In this article, we’re going to give you some great tips to speed up your research skills so you can put together a superb research paper without wasting precious time. Many students need these skills because they are rarely taught clearly in higher education institutions (unfortunately, many professors just assume that their students can easily figure out how to research complex works). Well, here’s what you need to know when to stop researching and finally begin writing a research paper. This is especially relevant for large research projects such as dissertations because they demand you to dedicate some time to research and write every day. Takeaway: admit that you have a research paper to write and make up the time to begin researching. Believe us, this simple time management trick will have a profound effect on the success of your research. Google has gotten pretty good at finding good information for custom writing, but you must still ensure that you’re giving it the right kind of keywords to work with. For example, let’s suppose that your task is to write a research paper on Nursing Informatics. To make sure that you have enough quality sources to work with, define at least three sets of keyword phrases featuring “Nursing Informatics.” Searching information using keywords is a popular technique used among high school students to professionals from a paper writing service. 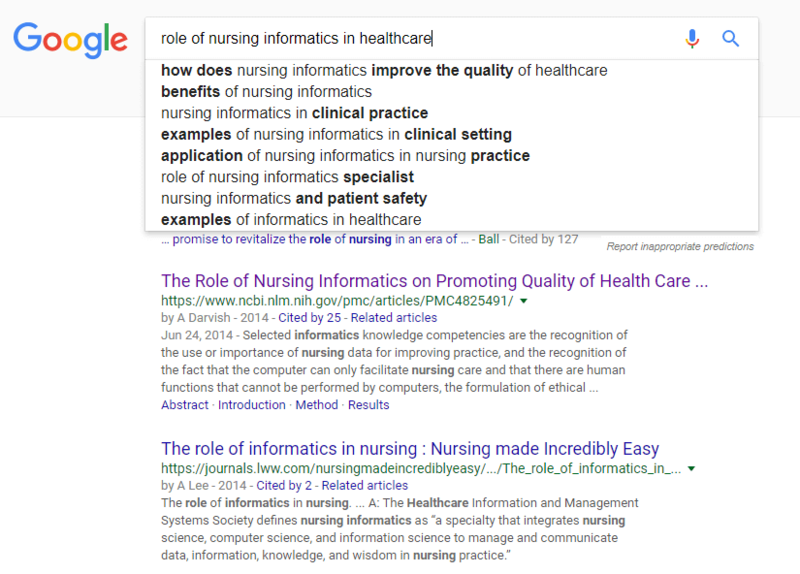 So, type the keywords “Nursing Informatics” in Google’s search bar and see what kind of suggestions it gives you. As you can see, there are a lot of suggestions to choose from, so stick with three keyword phrases. Oh, and by the way, look at the image once again. Take a closer look at the two first search results under the suggestion box. They are peer-reviewed, recent scholarly articles from reputable sites. Already, we’ve found two good sources! Takeaway: this search strategy works well for more complex topics, too. Just spend a couple of minutes playing with the keywords and you’ll see what phrases generate the best results. Information could be changed by anyone. Uses information from other scholar sources. Peer-reviewed articles published in scientific journals. Takeaway: poor quality sources will undermine the quality of your paper, so make sure that the sources you’re planning to use in your paper meet the requirements in the last bullet list in this section. Although there is no universal answer to how many good sources students should find to begin writing, we recommend limiting the number to five sources. Then again, the final number depends on the requirements of your paper and the information you’ve found. Sometimes, it takes one or two sources to complete a great paper. If you’ve found most of these points in your literature, start writing! It’s likely that some of the sources you’re using contain all the information you need. For example, if you found a book on nursing informatics, take a look at the table of contents; it’s highly likely that it has all the information you need. You just have to spend a minute or two and find it. The deadline for the paper is quickly approaching. In this case, spending hours looking to double-check information is pointless. There are several steps that you need to take before you will see the signs that you’ve completed the search and need to start writing. Makeup time for research, find your resources, analyze them, and begin writing when you see that you’ve found most of the answers you need. It’s likely that you’ll know better how to look for the rest by the time you’ve done with the first piece.